One of the most common crimes these days is purse snatching. In addition, thousands of backpacks and briefcases are stolen as well. Could these all be prevented – no, but a good percentage of them could be. In many cases, the bag is stolen because the owner is distracted or not paying attention to the article, which is just what the criminal is waiting for. Grab Guard, the new safety device, is just what you need for this type situation. 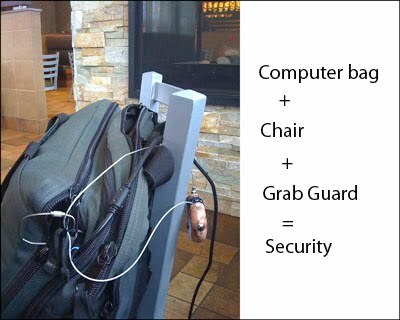 Grab Guard is a small length of reinforced aircraft cable, in a retractable holder, that attaches your backpack, purse, briefcase, suitcase, whatever – to some immoveable object. Then when the thief tries to grab and run – the bag goes nowhere. While shopping, playing with the dog, or watching a sports event, you just can’t keep your eye on your bag at all times. That’s the beauty of Grab Guard. It takes less than ten seconds to open the lock, pull the cable, stretch it through your bag’s handle, around a table leg and click it shut. Your bag is now secure. I’ve been using the lock for over a month now, and it comes in handy especially in the airport or at your local McDonalds. In each case, I’ve been using a laptop and when I had to get up to get a drink of water or check on my delayed flight, instead of having to pack up, I merely slipped my laptop in my bag, threaded the small Grab Guard cable right through the zipper pulls, around the chair handle and clicked it closed. Computer and bag secured in less than ten seconds. Upon my return, the two number combination lock is easy to quickly open and I’m back in business. This isn’t the lock to use for long term storage security as it could be cut with cable cutters, but in most busy public places, a criminal is not going to be carrying cable or lock cutters.